This workshop will help approach enterprise search from a user-centric, holistic way. Text analytics can enhance KM applications of all kinds from basic knowledge repositories to advanced search to new models of knowledge. This workshop covers how to create an integrated platform to support all these applications and more. To create this platform requires an understanding of the full range of text analytics capabilities (entity extraction, auto-categorization, sentiment analysis, etc.) as well as a practical guide to how to get started (business justification, selection of software, training, etc.). This workshop is based on Tom Reamy’s new book, Deep Text: Using Text Analytics to Overcome Information Overload, Get Real Business Value from Social Media, and Add Big(ger) Text to Big Data. ​Organizing is a fundamental issue in many disciplines, most notably library and information science, computer science, systems analysis, informatics, law, economics, and business. However, these disciplines have only limited agreement in how they approach problems of organizing and what they seek as their solutions. This talk presents a higher level framework for issues and problems of organizing that emphasizes the common concepts and goals of the disciplines that study them. The framework proposes that every “Organizing System” involves a collection of resources, and we can treat physical things, digital things, information about such things, and even the people who use them as resources. Every Organizing System involves a choice of properties or principles used to describe and arrange the resources, and ways of supporting interactions with the resources. By comparing and contrasting how these activities take place in different contexts and domains, we can identify patterns of organizing and see that Organizing Systems often follow a common life cycle. ​Challenge Session – Why are we here? What issues and challenges in knowledge organization are we facing? • What is Deep Text and why should you care? ​Welcome to the conference from the Conference Curators. 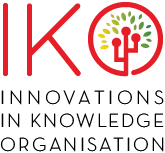 Would you like to Sponsor IKO 2016?